The beefcake parade is back again and we’re mightily pleased that it has. This review covers both PSP and PS2 versions of the same game with both games virtually identical with a few minor alterations. Released earlier on the PS2 to great acclaim, the game on PSP is pretty much a straight port of a great game with very little missing in terms of content making it’s way from the PS2 to the handheld. Our only real major differences between the two formats is that there are a number of mini games on the PSP version that really don’t add much to the overall experience and also the load times for the PSP are quite lengthy. They could have pretty much have left out the mini games and it would still have been top notch. Possibly the first thing to cover is that this is the best wrestling game that I’ve seen so far on the market. Developer Yukes has had the reins for some time now and the enhancements that have gone into the engine are great, making for some very controllable wrestling that shouldn’t lose players. Wrestlers behave the way that you would expect with a learning curve of about 20 odd minutes to have you doing things in the ring in the way you want. Graphically the title is an absolute treat to the eyes and the animations and signature moves look totally authentic from both the PS2 and PSP. One of the many cool things in this game is the added ability to take those taunts and sig moves from your opponent and steal the power from them that this would usually create. If you time it just right you can totally drain all their power which is pretty neat. 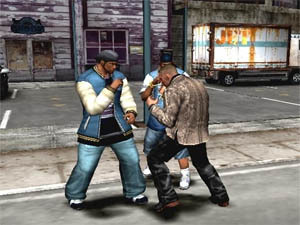 There are a great many touch ups to the existing gameplay as well with many more control options for players to utilise, including more brawling options during ladder matches which always proved to be soooo frustrating when you were getting into it. 2006 provides a satisfying play experience that you can’t really complain about. The thing I enjoyed the most was following the storyline with what would have to be the tightest scripting of a wrestling game to date. The actual wrestlers supply the voice talent and ham it all up appropriately, lending to the credibility of the title. 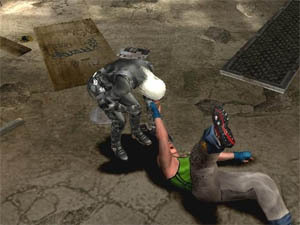 The music also used is appropriate to the individual wrestler, making your game time an extravaganza. If I had to make one complaint about the title, it would simply be that once again the collision detection is a bit out resulting in times when you’ll exclaim “but I know I hit that guy!”. It’s tons better than it used to be but still annoying. For those of you who have both games for PS2 and PSP, take your games on the go with the ability to transfer season mode and create a wrestler between systems! Finally there is a Manager mode, taking your experience from the ring to looking after your wrestling stars and everything that goes with dealing with high profile personalities (and rookies at the start). As time progresses, you earn more money from shows and can train wrestlers and also buy big name stars. It’s well worth looking through to really experience the whole kit and kaboodle. Get out there and get some beefcake, ya dig! A true treat for PS2 owners and PSP owners alike.